Playgrounds.net Blog: How to Select Outdoor Wooden Swing Sets? How to Select Outdoor Wooden Swing Sets? For families looking for playground equipment that will last; wooden swing sets outdoor offer the perfect solution for active children with an appetite for fun. Wooden playground equipment is not only built to withstand constant use, but quality cedar or redwood swing sets are attractive, well crafted, and will fit in to virtually any backyard decor. 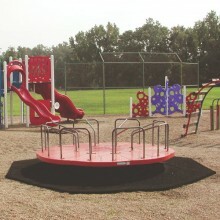 Harsh elements such as wind, sun, and rain can take their toll on outdoor playground equipment. Wood will withstand the daily use, and will resist fading, cracking, and warping under the stress of severe weather. Solid construction is essential for wooden swing sets. Outdoor playground equipment needs to be selected with great care keeping safety of children in mind... Quality craftsmanship ensures that children will be safe, even as they test the limits by testing their own physical abilities. Wooden playground equipment is the perfect choice for active families. It will stand the test of time, and the test of children.